Core inflation is the price change of goods and services minus food and energy. It represents the most accurate picture of underlying inflation trends. Food and energy products are too volatile to be included. They change so quickly they throw off an accurate reading of inflation. The commodities market is the culprit behind this volatility. Most food (like wheat, pork, and beef) and energy (oil, gas, natural gas) are traded all day long. For example, commodities traders bid up oil prices if they suspect its supply will fall or demand will rise. They might think a war will dry up the supply of oil. They'll buy oil at today's price to sell at tomorrow's higher anticipated price. That is enough to drive up oil prices. If the war doesn't materialize, oil prices fall when they sell. 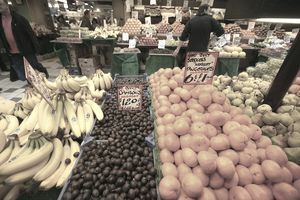 That makes food and energy prices dependent on quick-changing human emotions, not slow-changing real supply and demand. Food prices rise along with gas prices because transportation is dependent on trucking. It consumes a lot of gas. When oil prices rise, you'll see the effect a week later in gas prices. If gas prices stay up, you'll see the effect on food prices in a few weeks. The Federal Reserve's mandate is to control inflation. It uses interest rates to do this. You don't want interest rates to bounce up and down each week along with gas prices. The Fed's tools are slow-acting. It can take 6 to 18 months before the effect of a change in the Fed funds rate will impact inflation. How does the fed funds rate affect inflation? If the fed funds rate increases, so will the rate for bank loans and adjustable rate mortgages. As credit tightens, economic growth slows. Companies must lower their prices to stay in business. That reduces inflation. The Fed uses inflation rate targeting. It would rather not take action if the core inflation rate is 2 percent lower compared to last year. What happens if the core inflation rate starts to creep above that inflation target and stays there? The Fed considers raising interest rates and other contractionary monetary policy. The Fed has to weigh this with its other mandate, encouraging economic growth and creating jobs. For example, inflation rises during the summer. The Fed would not want to increase interest rates every summer and lower them every fall. Instead, it waits to see if those increases drive up the prices of other goods and services. If gas and oil prices stay high for a long period, they will drive up the prices of everything else. That's why the Fed looks at both the headline inflation rate, which includes food and energy prices, as well as the core inflation rate, which does not. The core inflation rate is measured by both the core Consumer Price Index and the core Personal Consumption Expenditures price index. In January 2012, the Federal Reserve reported at its FOMC meeting that it preferred to use the PCE price index because it gave a better indication of underlying inflation trends than the core CPI. It's less volatile thanks to the way it's measured. The Bureau of Economic Administration measures prices changes using gross domestic product data. It then adds the monthly Retail Survey data. It adjusts them to consumer prices using the CPI itself. It uses a different formula than the CPI to compute its estimates. That formula smooths out any data irregularities. The Bureau of Labor Statistics collects the prices of good and services sold by 23,000 businesses based on a survey of 14,500 families to get the CPI. As you can imagine, this is a serious number-crunching, and it gives a pretty good indication of price changes. But it is not as inclusive as the PCE price index. To get the core inflation rate, both the BEA and the BLS take out the prices of any food or energy goods sold. Inflation is when the prices of the goods and services you buy continue to go up over time. If your income doesn't go up at the same rate, then you are losing buying power as prices rise. The only time inflation doesn't weaken your standard of living is when it happens to your income. It also helps when prices rise in something you own, like your home or stock portfolio. That's known as asset inflation or an asset bubble. Inflation has a subtle yet destructive effect on economic growth. It's subtle because you may only notice it over time if it's only a one or two percent increase. It can have a bit of a positive effect at that rate. That's because you will stock up on goods now because you know the price will rise in the future. That increases demand, which stimulates economic growth. Over time, inflation robs the economy of growth potential. That's because people spend more and more on essentials, like food and gas, and less on other consumer products. Those other businesses are less profitable, and some will close down over time. That lowers the country's economic output.